In addition to a DVD, we can prepare your movie for viewing on a mobile device and sharing with others. If you are shooting with a mobile phone, the natural tendency is to hold it vertical (straight up and down, otherwise known as portrait mode). But movies are always horizontal. Get in the habit of holding your phone or tablet horizontal when shooting. That way we won't have to crop and enlarge the image or put black bars on either side to fill the screen. 2. QUIET ON THE SET! Avoid the temptation to narrate throughout a scene. We almost hate to say this, because it actually helps us determine who's who, what's what, and how important certain scenes are. The problem is that you are closer to the microphone than anyone else, so your voice can easily drown out everything else. So just try to do it as little as possible. The tally is the red light on the front of a camcorder that illuminates when you are shooting. 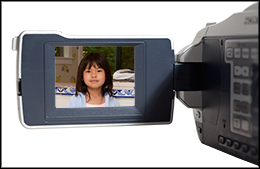 It's a built-in way to remind people that they are on camera and to be self-conscious. Check the camcorder's manual for how to disable the tally light. A great deal of most people's video is shot indoors or in relatively dim light. When buying a camera, check the specs and reviews for low light performance. This is one of the few areas where camera capabilities vary greatly, and there doesn't seem to be a direct correlation to price. Easy does it when zooming in on your subject. Or out. Panning is moving the shot from left to right (or vice versa). A nice, slow, gentle pan is a treat for the viewer. A quick lurch from side to side is unwatchable. We can correct many errors like this, especially with a static scene. But you will always be happier with the quality of an image that is well shot. Especially before and after zooming or panning, hold the shot for a few seconds. Sometimes you will capture something unexpected. Painters call these "happy accidents." Photographers call them "the shots between the shots." Even if serendipity doesn't occur, having a few extra stable seconds on both ends of a scene virtually guarantees smooth transitions in the final edit. A viewer's eye gets bored very quickly. It wants variety. Shoot scenes from different angles, sides and perspectives. It doesn't matter if they aren't shot in proper order. It doesn't even matter if the audio isn't in sync. We make all that work in the editing bay. Mixing it up also makes shooting a lot more fun and interesting. An establishing shot is a brief scene that communicates where the action is taking place. Signs, landmarks, familiar sights all fill the bill. They eliminate the need for an on-screen title or a narration to tell the viewer what he or she is looking at. Once again, you don't have to shoot them in sequence. As long as you get it, we can put it where it belongs.